As promised, here are the other suggestions I was sent through when I asked for Spanish personalities to feature in a post on the letter K.
Spanish artist still going strong. A punk-rock group formed in the late 70’s, headed by Alaska. Olvido Gara, who has always been known as Alaska, has managed to reinvent herself through the decades and still remains in the public spotlight. Most probably spelt Quico, but what a great excuse to talk about Verano azul in this blog. In February I asked my Facebook friends and Twitter followers to help me come up with the subject for a post on Spanish personalities, as I was pretty stuck on the letter K. I got some very interesting suggestions, some of which I had already thought of, some of which I would never have come up with, like the one heading this post (thanks @grahunt!). It’s taken me a while to write this post – especially as I realised that in my angst to talk about Juan Carlos I, the king who has fallen from grace, I missed out the post on “I”. So, before I tackle that one, here is my post on Karlos Arguiñano. It will be followed by an extra post on K, to include all the other interesting suggestions that were posted (or sent) my way. As is often the case, until I started writing this post, I knew very little about Arguiñano. as he shot to fame in 1991, just a year after I left Spain. 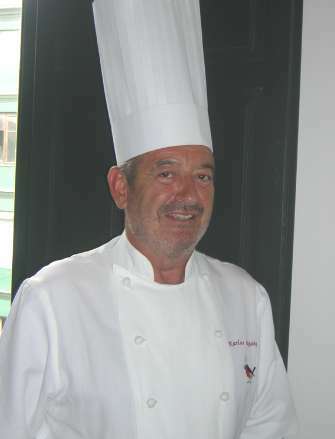 He’s not just a celebrity chef, but a very charistmatic entrepreneur who owns a restaurant (which he set up way before he hit the spotlight), one of the co-founders of the Basque Culinary Centre, film producer and he even runs a moto-racing team. Oh, and he’s the father of eight children, two of whom are adopted. Arguiñano grew up as the eldest of four children whose mother had become disabled. That was probably the reason why he had to start cooking at an early age and, by the time he was 17, he had decided he wanted to become a professional cook. In 1978, he opened a hotel/restaurant in the town of Zarautz, in Gipuzkoa (native spelling). For 199 Euros, you can have a double room, a “taster” menu and breakfast in the KA, Karlos Arguiñano hotel. 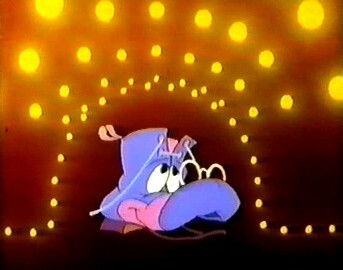 In 1991, after hosting his own cooking programme on Basque television, he began to present “El menú de cada día” on TVE1, the main channel of Televisión Española. The programme got people talking about cooking, even if most of the audience rarely put any of the chef’s tips into practice and was just happy to watch this funny, charismatic man. A man increasing the ratings of a TV cooking programme. That is why I thought it would be worth dedicating a post to him. I’m willing to be proved wrong, but the average family still favours women being the ones who cook and it was great to remind men that spending time in the kitchen was ok. Things are definitely changing and women my generation might still land someone to share the culinary chores with them. Back to Arguiñano, having conquered the small screen, Karlos now has turned to another one of his passions: motorcycle racing. In 2011, he introduced the Arguiñano Racing Team when it took part in the Moto 2 competition. I watched an interview with him on YouTube and loved his relaxed manner as he talked about what is no doubt, the realisation of a dream. A dream which probably (my guess, not his words) began to look possible when he cooked for Carlos Sainz during the racer’s stay at the hotel where Arguiñano worked. I leave you with the interview, which I much prefer to the many clips there are of him telling jokes. I wish him the best of luck with this parallel career! After qu ite a break from my last Spanish Personalities post, I’m back, ready to give it another try. Instead, I am dedicating this post to Hernán Cortés, which, if he had been alive today, would probably have been an unpopular figure. Hernán Cortés was one of the famous conquistadores. He started looking for adventure in 1504, just 12 years after America was discovered by Columbus. Cortés was only 17 years old then and had abandoned studying law to become an explorer. After being involved in the conquest of Cuba, he was the conquistador responsible for taking over the Aztec empire, conquering Mexico in 1521. The conquistadores were ruthless, taking over new lands by force, with the sole purpose of building an empire. Things have most definitely changed: the Spanish empire has not only completely disappeared (although there’s still Ceuta, Melilla and the Canary Islands to remind us that Spain used to own land beyond their borders) but Spain itself seems to be falling apart. At a time when the economic crisis should be pulling everyone together, the regions are voicing their desire for independence more strongly than ever and it’s difficult to talk about “one Spain”. I wonder whether a song which was popular in the 80’s “The Empire Strikes Back” by a group called Los Nikis could have been written now. Probably not, but that’s not a bad thing. But I digress (once more). 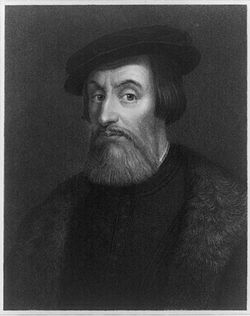 Having had eleven children from six different women (including natives from the lands which he was invading), having owned land and slaves in Cuba, having been in jail for “conspiring” against the Cuban ruler and having led various wars and invasions in Mexico, Cortés died in 1547. His body, like that of Felipe el Hermoso, did not rest in peace but was moved around various times due to different reasons such as refurbishment of the temple where he was buried and an attempt to follow his will, where he changed his mind various times as to where he wanted to be laid to rest. So, that was quite a dark ‘H’ so I would now like to leave you with a more colourful one. Let me introduce you to Horacio Pinchadiscos. He was the best D.J. in the 80s, delighting children like yours truly, with his marcha. It would have been too much to dedicate a full post to him, but I’m happy to give him my last few words. Doing a little bit more research for The A to Z of Spanish Culture, I came across a website dedicated to the t.v. gameshow: “Un, Dos, Tres”. 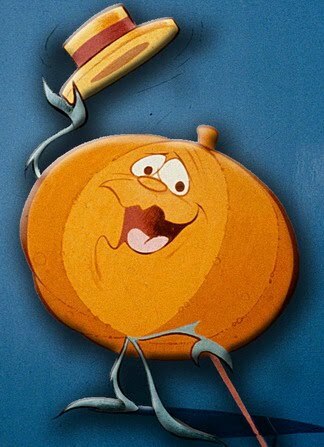 Many were also the different “mascotas”, my favourite being the pumpkin Ruperta, the very first mascot who also reappeared in the latest versions of the programme. This mascot injected the show with a little bit of irony, as participants could win these pumpkins, the calabaza Ruperta. They were the worst prize in the show. In Spanish there is a saying which means “piss off” involving these calabazas: “Que te den calabazas,” which literally means “I hope they give you pumpkins”. Plenty of merchandising was released in parallel to this show, including the numerous “cromos”, kind of sticker/cards that were sold to children to collect. When I was 13, I collected many of these cromos (or were they bubblegum wraps?) featuring the second mascot, La Bota Clotilde (below), with the hope of taking my classmates on a viaje de fin de curso, end of year trip. I never won, of course, I never win anything. I remember the couples in the Un, Dos, Tres often won an “Apartamento en Torrevieja” and they used to be “amigos y residentes en Madrid“, when “amigos” also meant “sleeping together but not in a proper relationship so we’d better just say we are friends”. Many humorists became famous throughout Spain thanks to this programme, my personal favourites being Bigote Arrocet and Beatriz Carvajal (who was actually already well established as an actress) as the prostitute who was always jealous of “la pelos”. So, it’s 40 years since this programme first appeared on Spanish T.V. Definitely worth a mention on this A to Z of Spanish Culture blog, even if it shows my age. As someone who used to watch quite a lot of TV as a teenager, I was a great fan of “La bola de cristal”, a tv programme from the 80s (The Crystal Ball). The ‘electroduendes” (electric elves, see also D is for Duende), were irreverent creatures who artistically portrayed their creators’ political views. For example, the Bruja Averia (The Fault Witch) has a range of slogans including “viva el mal, viva el capital” (Hoorah for Evil; Hoorah for Capital). 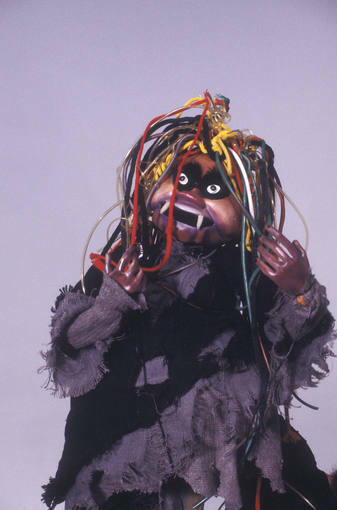 Although the form seemed to be aimed at young children (puppets whose puppeteers had trained with Jim Henson), the underlying themes of the Electroduendes were definitely of interest to older viewers. La Bola de Cristal ended with a segment hosting the most popular pop bands of the time. In fact, the second half of the programme was hosted by Alaska, who with Kaka de Luxe and Alaska y los Pegamoides (‘pegamoides’ has no translation, sorry!) became one of the most famous punk stars in the 80s. (She is still going by the way, still featuring in Spanish culture). Nostalgia for what was an exiting era in Spain can now be satiated through the purchase of DVDs of the series or many You Tube appearances. If you speak Spanish and would like to find out more about the programme, or just have a look at the videos and pictures, visit http://www.rtve.es/television/la-bola-de-cristal/ For a different type of Spanish TV personality, see E is for Espinete.